Washington, DC–(ENEWSPF)–January 16, 2016. A new analysis finds that sales of organic pest control products are now on par with their traditional chemical pest controls for U.S. garden retailers, with retailers reporting that the organic options have a higher increase in sales than their chemical counterpart each year. The report, by Greenhouse Grower, an industry publication for the commercial floriculture industry in the U.S., pulls data from several years of Greenhouse Grower’s retail State of the Industry Surveys. The research reflects growing consumer awareness about the hazards of pesticides and viability of organic options, amidst consumer actions encouraging big-box retailers, as well as local hardware stores and garden centers, to eliminate neonicotinoid pesticides (which have emerged as the leading cause of bee declines), and “Make the Switch” from conventional pest control products to organics. According to Greenhouse Grower, the number of garden retailers responding each year ranges from 216 (in 2014) to 440 (in 2013). The national picture shows that a similar number of retailers are stocking both conventional chemical and organic pesticides, with 78.3% of retailers stocking chemical controls, which is only slightly higher than the 77.93% that carry organics. The report also points out that conventional chemical pest controls still contribute more to the bottom line for retailers, however it is only by a small amount. In 2014, traditional chemical pest control sales made up 2.55% of total sales, which was up slightly compared to 2013, when retailers reported that these products made up 2.21% of sales. Compare that to organic controls where in 2014, sales made up 2.25% of total sales, which was up compared to 2013, when retailers reported the category made up 1.96% of sales. However, organic controls were much less likely to be reported as having a decrease in sale compared to their chemical counterparts. In contrast, the most common trend retailers reported for organic pest control sales was an increase in sales, while traditional pesticides were one of the highest categories for decreased sales. Indeed, this news comes as no shock to environmental advocates who have been working to encourage businesses to consider the impact that the products they sell have on the environment, human health, and pollinators. In December, Home Depot, the world’s largest home-improvement chain, announced that it will no longer use neonicotinoid pesticides (linked to bee decline) in 80 percent of its flowering plants, and that it will complete its phase-out in plants by 2018. This follows the announcement made by Lowe’s in April of last year to phase out the sale of products containing neonicotinoid pesticides within 48 months. 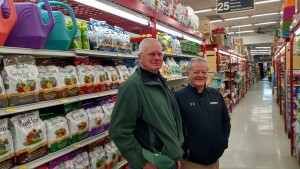 Additionally, Beyond Pesticides has been working with forward looking businesses, including Eldredge Lumber and Hardware in York, Maine, which are part of this national trend of clearing their store shelves of harmful synthetic pesticides and fertilizers in favor of organic materials. Eldredge is encouraging consumers to employ alternatives by consciously stocking their shelves with organic compatible products. Efforts by local businesses to stock alternatives and educate consumers on their use is a wonderful example of creating change through grassroots efforts and a bottom-up approach, and offers an alternative to big-box stores focused simply on replacing products. Beyond Pesticides has produced the video Making the Switch, which highlights Eldredge Lumber and Hardware’s efforts to orient its customers towards safer management practices. “You’re protecting your environment, you’re protecting your family, your children and grandchildren, and your neighbors. Nobody wants to have pesticides drifting into their front or year yard, and people are just loving it, they’re feeding into it. I couldn’t be happier,” says owner Scott Eldredge. To assist local garden centers and hardware stores in transitioning their customers to organic practices, Beyond Pesticides has crafted the “Well-Stocked Hardware Store,” which provides the products and tools necessary to support a move to healthy, organic landscapes. This guide fits in with Beyond Pesticides’ Model Pesticide Policy and Implementation Plan for Communities, but can be used independently for hardware stores and garden supply centers looking to encourage the use of products and practices that protect the health of their customers, community, and the wider environment. Take Action: Sign on to our letter to ask True Value and Ace Hardware to join their competitors and eliminate bee-killing pesticides and switch to organic products. Reports of increasing sales of organic pest controls show that consumers care about the products that they use. There are no more excuses — we know it’s possible to get these pesticides off their shelves. For more information on how hardware stores can go organic and protect pollinators, see Beyond Pesticides’ video, Making the Switch, and our report on A Well-Stocked Hardware Store!